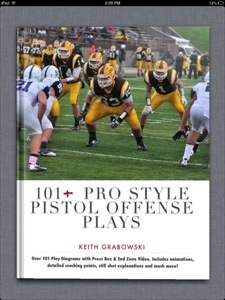 Please check out my iBooks for the iPad and Mac: 101+ Pro Style Pistol Offense Plays and The Zone Offense: Create a Structured System. The value in the enormous amount of content and detail is better than any coaching resource you can find anywhere else. the interactivity and dynamic content work in a way that give you all the details to utilized the concepts being shared. Each is also available by chapter (101+ and Zone Offense) and will soon be available for the iPhone and other devices. Synergy is combining multiple elements so that the result is greater than the sum of the the individual elements. The synergy principle applies to packaged plays in offense. In any packaged play, the quarterback is given both presnap and postsnap keys that help him determine which concept to distribute the ball to. The packaged plays concept has been around for a while. 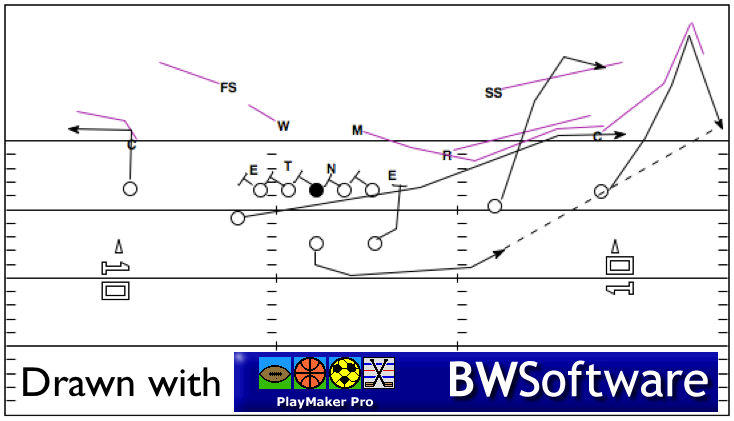 It became popular within the spread offense with the advent of the zone read-bubble play. 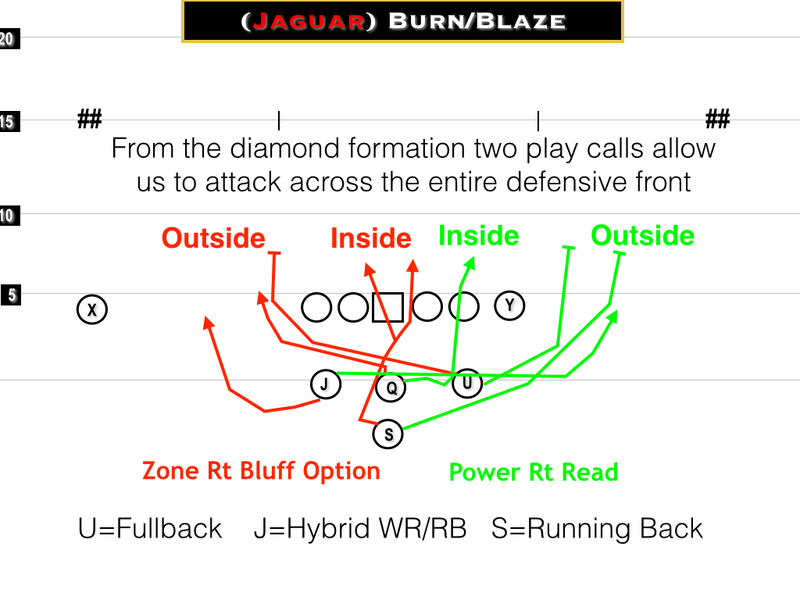 The play packages the inside zone with a perimeter bubble screen, and the defense is forced to defend the entire field. 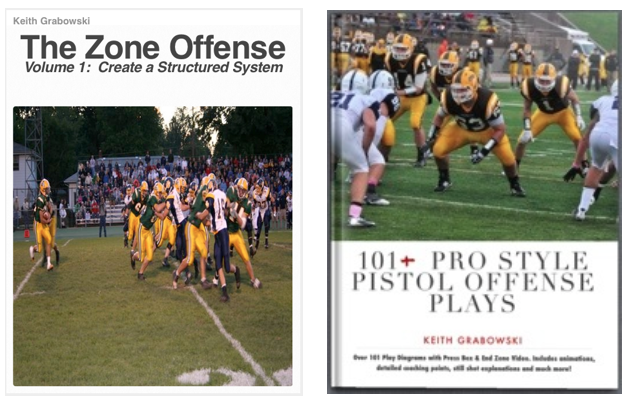 Be sure to search my site for other articles and resources on packaged plays. Use the keywords “packaged plays” in the search box. The realm of packaged plays just seems to keep expanding. 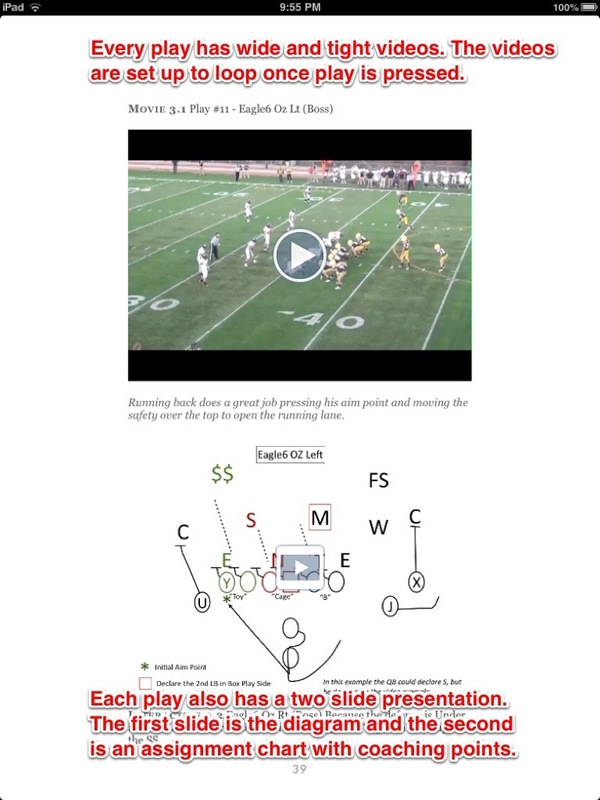 We have used a play that reads one edge and blocks the perimeter for jet sweep and has pin and pull blocking for the quarterback to keep and run sweep the opposite way. In the first video, the QB sees the DE he is reading widen with the jet sweep, so he keeps it back the other way getting behind his pullers out on the perimeter. The next clip show the end being blocked. The running back was wrong on this play. We wanted him to go to the perimeter. His man was the defender that caused a fumble, but you can see how this play develops going to the jet sweep side. This fit for us as part of a wildcat package with a dynamic quarterback. It does provide another nice constraint play for the power read. 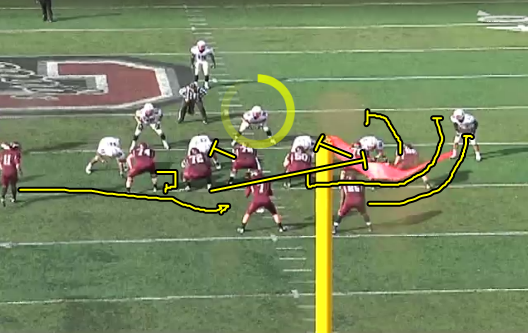 I was watching some cut-ups and came across a play that Colgate ran two years ago against Lafayette. I can’t know for sure if this was designed as a read play, but it made me think about the potential that it has as a read play. In theory it would allow another hat on the edge on the sweep portion of the play, and it allows the quarterback to keep the ball inside running into a huge void if the linebacker flows to stop the sweep. The tricky part would be the rules for the tight end who is leaving the defensive end alone and blocking the linebacker. Theoretically, he would be blocking the backside linebacker as the frontside backer would be left as the player being read. He would not necessarily need to get all the way back. The frontside guard is pulling for the alley, and the backside guard is on a long trap course to the defensive end. He would be aiming to kick him out. In the clip, the linebacker sits and the quarterback gives to the receiver in motion on the sweep. 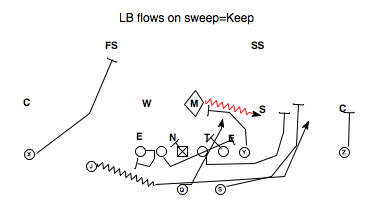 If the linebacker flowed on sweep, he would keep and come off the down block of the tackle on the 3 technique. Another way to block this sweep/trap read play would be to block down on the end with the TE, block to the BSLB with the tackle, and trap the 3 tech. It might clean up any confusion as to who the TE would be blocking. However, the path would be tighter for the quarterback, and the decision would have to be made quicker. If the objective is to get a hat on a hat on the edge, and change up the Power Read fits for the defense, then this may have some potential as a constraint play. Colgate only ran it one time in the game, so it may have been exactly that for them as well. With a rare game ending 109 yard field goal return, what seems to be getting lost in the shuffle is the touchdown that tied it up for Auburn with :32 seconds left. The play was a run-pass option off of an inside zone read. The run concept is something made popular by Chris Ault at Nevada, and is becoming more and more popular as the zone option is taking root in the NFL. Chris Brown writes about it here. The concept is called “Bluff” by Ault. A fullback or h-back is responsible for bluffing a kick out block on the end, who is also being read by the quarterback for give or keep. The FB/HB continues past the end and becomes a lead blocker for the quarterback as seen in the video below. The play with the addition of the pass component is not new. 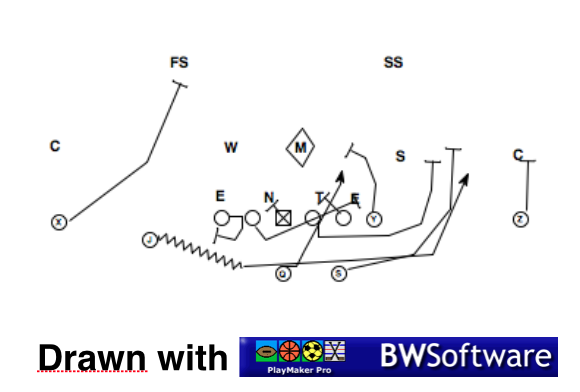 Pitt used this play in 2012. It is legal as long as there are no ineligible receivers farther than 3 yards down field. On a keep read, the quarterback sprints toward the edge and has a run pass option. 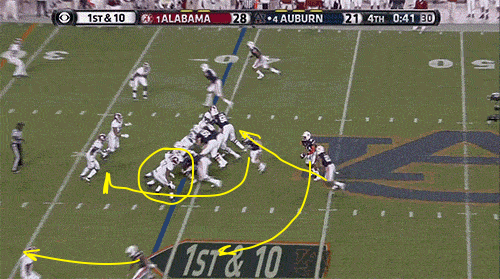 If the corner is playing a cover two technique or if the corner fills on the run, then the receiver runs a fade and the quarterback hits him in the void between the corner and the safety, which is exactly what Marshall did for Auburn. I will post more links to packaged plays later today.